If you are the one who would like to use all the applications in mobile then Google has launched an update to Google Drive that lets us to create a new spreadsheet or edit an existing one right from the Drive application on iPhone, iPad or Android device. We can edit fonts, resize columns, sort data and do much more in a spreadsheet. As the entire service is done online, we can notice others editing and commenting over various documents. 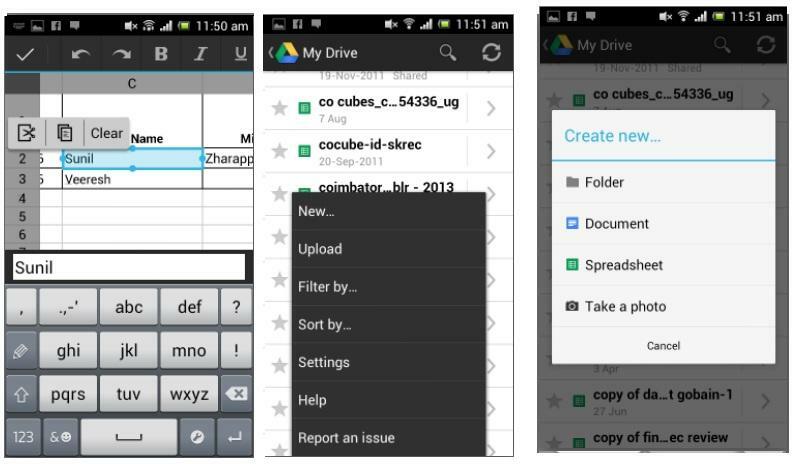 Google Drive helps us to create a shortcut to Drive files and folders on mobile homescreen. This will allow you to directly access frequently accessed files and folders from the shortcuts on the homescreen instead of having to navigate to the Drive application, opening it and then browsing to the desired file or folder, hence it makes us to access the files and folders more easily. Editing can be done completely with the ability to zoom, directly edit formulae and resize and re-style cells. 1. Google spreadsheets editing can be done in new native editor. 2. We can edit contents of tables in Google Documents editor. 3. Formatting is enabled when copy/pasting within Google Documents. 4. Do single tap to enter edit mode in Google Documents editor. 5. Add a shortcut to Drive files/folders to your homescreen for quick access. We can maintain formatting while copying and pasting within Documents. Drive has done improvements in increasing the integration between its various services and the cloud storage solution. Drive has now been integrated into Gmail, allowing us to directly attach files to emails from Google Drive. We can attach maximum of 10GB worth of files to our emails. The Send Link option for files and folders has a new option that lets us to copy links to the clipboard. The files sent are stored in cloud, hence it helps us to access the most recent version of the file. There is an files sharing settings which helps users to change options of sharing files to everyone or not to anyone, So we can select our required option to be enabled. The new features upcoming will be accessible only with Gmail's new compose experience. Recently Google has planned to launch the Google Drive now lets us share our files on Google+. This feature enables users to view presentations, open PDFs, and play video and music, right from their Google+ stream. Google+ adds functionality that lets us to view our documents and presentations in the Google+ stream itself. On mobile device, the documents or files will open in the Google Drive application. Google drive application in mobile enables users to use all facilities like holiday recipes, shopping lists, or just your family budget more easily, the Drive application on your mobile device makes it easy to get things done wherever we are. So Google Drive's launch in mobile phones makes our life easier and people will get benefits out of it.